When Batman flew by helicopter over Hong Kong harbour five years ago, he made minor movie history. Film aficionados will know that the scene from The Dark Knight was the first in a major feature film to be shot with an IMAX camera. The director, Christopher Nolan, chose it for one reason – the pictures it captures are simply enormous. It was a wise decision. A single glance doesn't really do Hong Kong's iconic panorama justice, but by taking to the skies, the Caped Crusader was being a bit of a wimp. In 1881, a Scottish railwayman called Alexander Findlay Smith became convinced of the possibility of building a funicular railway up the impossibly steep Victoria Peak, the island's highest mountain. Now, his engineering is Hong Kong's most popular attraction. The Peak Tram, as it has become known, has its Lower Terminus on Garden Road (00 852 2522 0922; thepeak.com.hk/en; return HK$40/£3.50). It takes around five minutes to travel the 1,400 metres to the top, gaining more than 400 metres in height as it does so. Suddenly, the entire city spreads out before you like a tablecloth thrown over the earth. Rows of gleaming metal towers shoot from beside the calm waters of the harbour up to the rolling forested hills – indeed it's the kind of vista that does demand an IMAX lens to take it in. After experiencing this overview, take the tram back down and from the terminus in Central – Hong Kong's glistening business district – head up Garden Road until you reach the Bank of China Tower whose triangular glass panels make it stand out from the crowd. This is Downtown – the belly of the beast, but its historical centre too. Turn left on to Queens Road Central, left again on to D'Aguilar Street, and then take your first right on to Stanley Street. The sound of greedy slurping indicates your arrival in one of the last vestiges of Hong Kong's once thriving street food scene. Not so long ago, you'd find hundreds of dai pai dong in Hong Kong, but today only 28 official open-air food stalls remain. The words translate as "big licence"; after the Second World War, special street food licences – with larger badges than usual – were given out in haste to the struggling families of deceased soldiers or civil servants so that they could earn a living. But almost all have since fallen victim to air-conditioned progress. However, several stalls serve authentic dim sum, which roughly means "a little bit from the heart". Sing Kee, at Nos 9 & 10 is the busiest, and with good reason. The service is a little brisk, but the food is authentic. Cuttlefish is popular, as are fish-skin dumplings. There's also eggs with shrimp for the less adventurous. Carry on west to where Stanley Street crosses Cochrane Street and take the Mid-Levels Escalator up to Hollywood Road, right at the top. These 800-metre-long, covered escalators, opened in 1993, are now an important commuter route which tackles Hong Kong's hilly terrain and bustling traffic. From 6am to 10am, they run downhill, after which point they are switched in the other direction. Head west along Hollywood Road as it, and the surrounding streets, transform into a long stretch of stalls and antique shops, some cheap and cheerful, many eye-wateringly expensive. A few hundred metres further on, you'll find the largest of Hong Kong's Man Mo Taoist Temples that honour two of the many hundreds of gods: War and Literature. Here the two figures sit side by side, one brandishing a pen, the other a sword. Behind the red and gold doors, the air is alive with incense smoke. As recently as 100 years ago, it is maintained that when disputes could not be solved by British law, they would be settled here using a curious game of chance involving chicken's blood and pieces of yellow paper. A little further along Hollywood Road, turn right and take the stairs down to Queens Road Central. Turn left on to the escalators down to Connaught Road and then turn right to Hong Kong Central Station. This might seem an unusual location for a bite to eat, but it contains the third and newest branch of a Hong Kong institution, Tim Ho Wan (Hong Kong Station Podium Level 1, IFC Mall; 00 852 2332 3078; timhowan.com). The original (in nearby Kowloon) is the world's cheapest Michelin-starred restaurant. A di m sum meal, including the signature barbecue pork buns, can be bought for around £5. Come out of the other end of Hong Kong Central Station and walk along the harbour front at Lung Wo Road to Hong Kong's Exhibition Centre, a little low-rise blob framed by the skyscrapers that surround it. From 23-26 May it will be hosting, for the first time, Art Basel. More than 250 galleries from 35 countries will be exhibiting at the contemporary art show, and leading artists will be involved in panel discussions. Where the world's riches go, high-end art follows, and China is now the world's second-largest market. 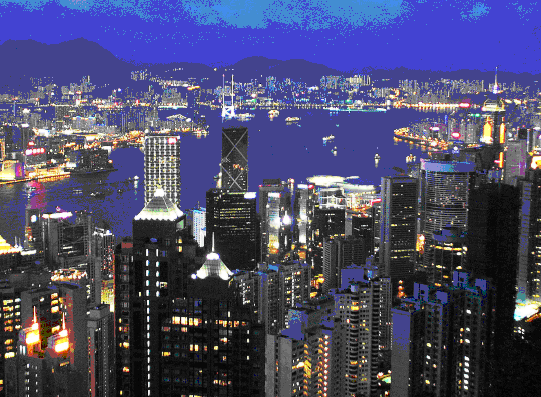 Hong Kong might just be embarking on the most exciting chapter in its history. Art Basel is at the Hong Kong Convention and Exhibition Centre, 1 Expo Drive (00 852 2824 2381; artbasel.com) from 23-26 May. Other galleries throughout the city are also taking part. Tickets HK$250 (£21). Rula Bula (58-62 D'Aguilar Street; 00 852 2179 5225; rulabula.com.hk) deals in "molecular cocktails" and DJs of world renown. An abbreviation from the Irish expression "Ri Ra agus Rúla Búla", meaning "uproar and commotion", it is the latest in a long line of offerings to the Hong Kong social scene from expatriate Irishman Cathal Kiely. Enomod (1-5 Elgin Street; 00 852 2555 6065; facebook.com/enomod) is a new Mediterranean "social dining experience". Cheeses, cold cuts, delicate tapas-style fish dishes and wine by the carafe set among seven different areas – including charcuterie counter, lounge area, communal dining tables and draught wine corner. Virgin Atlantic (0844 209 2770; virgin-atlantic.com) flies daily from Heathrow to Hong Kong. Returns start at £659. Cathay Pacific (020-8834 8888; cathaypacific.com) and British Airways (0844 493 0787) also fly Heathrow-Hong Kong. Many connecting flights are available. The Marco Polo Hotel, 13 Canton Road, Harbour City, Kowloon (00 852 2113 0088; marcopolohotels.com). Double rooms, with spectacular views over Hong Kong harbour, start at HK$1,700 (£144), without breakfast.